Providing Alternative Bodywork Therapy With Results For The Performance Horse & More! Integrated Equine Therapies (IET) stands alone in the horse industry. It is recognized for the high degree of effectiveness and its depth of information, and educational value. IET addresses the most common concerns horsemen/women have regarding horses. The unique IET Method consistently and repeatedly obtains results for acute and chronic conditions that are only superficially understood by almost all professional modern diagnostic methods. The ability to address vascular (blood), neural, endocrine, bone, organ, and nutritional dysfunction – puts IET in a truly elite niche of high demand. Integrated Equine Therapies clinics and courses offer the world’s most comprehensive and effective assessment techniques of common and elusive equine health issues. 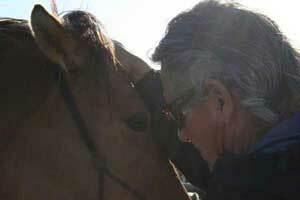 Today’s horse owners, riders, trainers, and therapists have become more knowledgeable than ever. They are seeking more effective solutions to the many common problematic conditions presented by horses. Our courses are uniquely focused on meeting these needs, and they vastly expand upon the assessment and effectiveness of most courses offered in the field. We offer unique techniques, approaches, and diagnostic protocols that have tremendous results and are easily verified by multiple means. Therefore, students who take even one class, or who chose to follow our advanced certification track will find their money and time well spent. Integrated Equine Therapies Hands-on Clinics & Courses are weekend to multi day clinics where students learn non-invasive, highly effective approaches that address the core causes of lameness, metabolic, and emotional dysfunction. This method integrates proven cutting edge modalities, such as Osteopathy, Cranial-Sacral, Applied Kinesiology, Acupressure TCM, Reiki, and Medical Intuition to resolve acute and chronic issues at their deepest level, thereby restoring normal function. 1st Course: (IET F1) Healing Forehand and Cranial Issues: Melding with Equus is the core course of the Integrated Equine Therapies Certification Program. 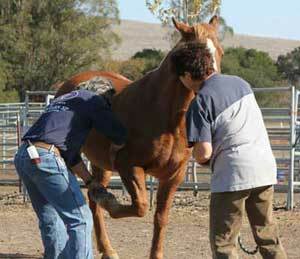 Students learn IET Method Foundation Techniques on Melding with Horses. 3rd Course: (IET F3) Healing Loin and Pelvic Issues: Deeper Connection with Equus is a 3-day hands-on foundational clinic will takes students more deeply into the Melding with Equus® methodology. It applies the core techniques taught in the previous two foundational clinics and integrate them with the Wisdom of the Body® approach. 5-Day Intensive: (IET F5) 5-Day Intensive IET Method is a 5-Day Hands-On Equine Therapies Course, students are taught the IET Method Melding with Equus® techniques. Melding is the connection we make with the horse on a deeper physical, emotional, and energetic level. Certification: Certification – (IET EFT) Equine Foundational Therapy Techniques We train horse people to define and address problematic conditions in their horses. This not only empowers students, but helps them create deeper relationships with their horses. 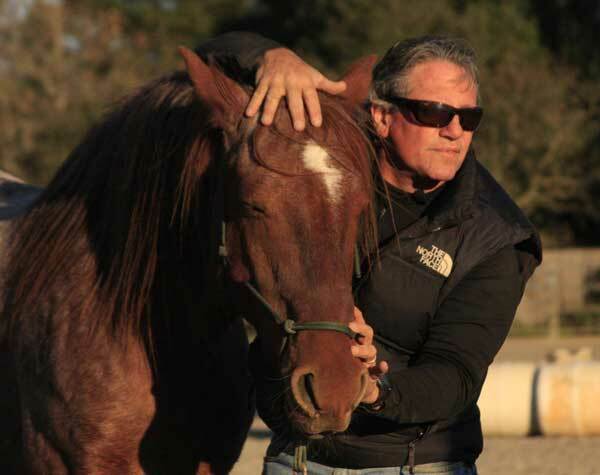 Students seeking certification are on a fast pathway to becoming elite equine practitioners by becoming recipients of my decades of training and refined techniques, and methodologies. 1st Course: (IET EQCST1) Equine CranioSacral Therapy 1 – Assessing The Core this course is one of our most effective and powerful modalities. This therapy deals with the horse’s spine and central nervous system, and it is able to correct physical or emotional patterns in any part of the equine body. 2nd Course: (IET EQCST2) Equine CranioSacral Techniques 2 in this 3-Day course, we build upon the techniques learned in the Equine CranioSacral Therapy 1 Course and explore deeply the CranioSacral systems and methods of gaining control over all aspects of the horse’s body. 3rd Course: (IET EQCST3) Equine CranioSacral Techniques 3 in this course students focus on healing chronic physical ailments by addressing the deepest causation of those ailments — emotional constrictions. Certification: Certification – (IET EFT) Equine Foundational Therapy Techniques in this program offers the most comprehensive and effective assessment of common and elusive equine health issues in the world today. Horse owners, riders, trainers, and therapists have become more knowledgeable and desire a deeper understanding of the common conditions their horses display. 1st Course: (IET EQ OSTEO1) Advanced Equine Osteopathic Techniques 1 in this course students learn to evaluate the whole horse and to quickly determine problems. They then learn which techniques will will resolve specific issues. Students are taught to work with the core energy of the horse and how to feel the central base rhythm of the equine body. 2nd Course: IET EQ OSTEO2) Advanced Equine Osteopathic Techniques 2 In this 3-Day Course Cranial and Cervical, students will focus on cranial and cervical assessments and treatments. Students will also learn Functional Indirect Techniques (FIT) that are applied to joints, bones, and soft tissue constrictions. 3rd Course: (IET EQ OSTEO3) Advanced Equine Osteopathic Techniques 3 in this course students will focus on becoming proficient at resetting diaphragm spasms, organ dysfunctions, urogenital system, and lumbar pelvis constrictions. 4th Course: (IET EQ OSTEO4) Advanced Equine Osteopathic Techniques 4 in this course Students will learn additional techniques, insights, and assessments tools The newest research and techniques will be covered in this course. Certification: (IET EQ OSTEO) Advanced Equine Osteopathic Techniques in this program teaches students how to obtain significant, lasting results to lameness, metabolic, and emotional conditions in horses that have not been correctable using modern allopathic and traditional treatments.